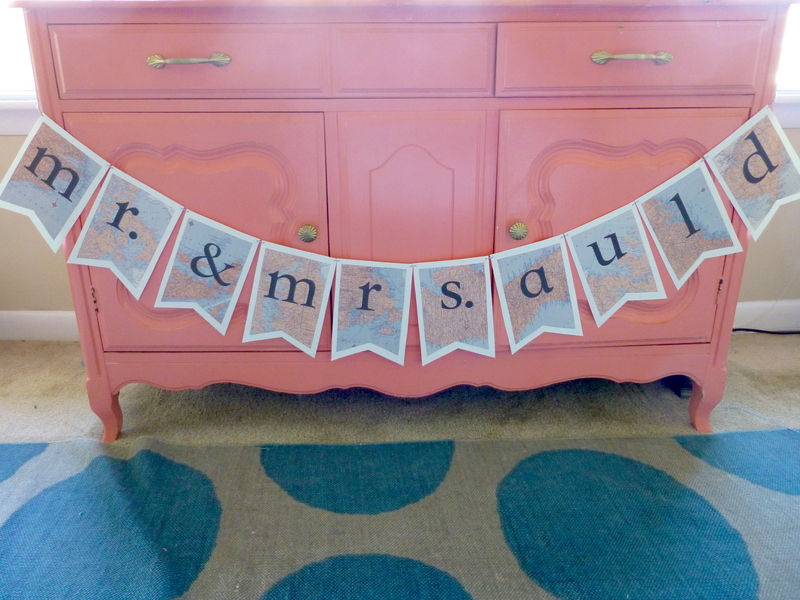 A few months ago, my close friend and bride-to-be asked if I would make a bunting that she and her future husband could use as a prop in their wedding photos. I knew immediately that I wanted to use map pages as the background, since Caitlin is a true traveler at heart and met her mate abroad. So, I kept my eyes peeled and came across a wonderful vintage atlas from the 1960s in a thrift shop for a quarter. After finding and downloading a template online, I traced the shape onto the map pages and cut them out. Since the map paper was thin, I decided to make a second, more rigid layer; I just increased the size of the original template by about 20 percent, and traced it onto a nice thick watercolor paper. 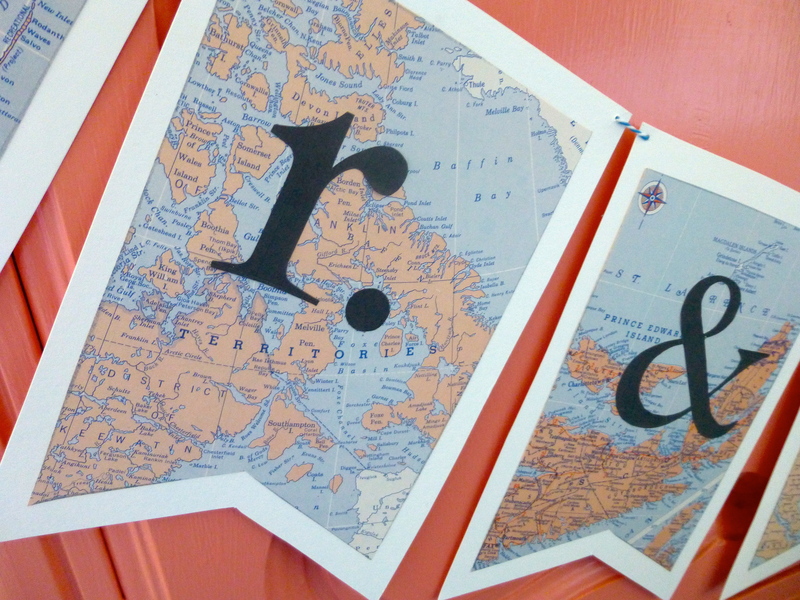 I used scrapbooking adhesive to attach the map pieces onto the background paper. Then, I printed the words onto label paper (so it would be sticky and I wouldn’t have to deal with trying to glue the letters down onto the bunting) and meticulously cut them out and attached them. Finally I punched small holes in each of the flags and threaded a piece of blue and white baker’s twine through the holes. I was really pleased with the end result and I think the bride was too. From the beginning she made it clear that her vision was to incorporate as many handmade and personalized touches as possible. She made the gorgeous brooch bouquets that she and her bridesmaids carried, painted centerpieces, and enlisted talented Etsy artists to make her cake toppers and wedding dress hanger. 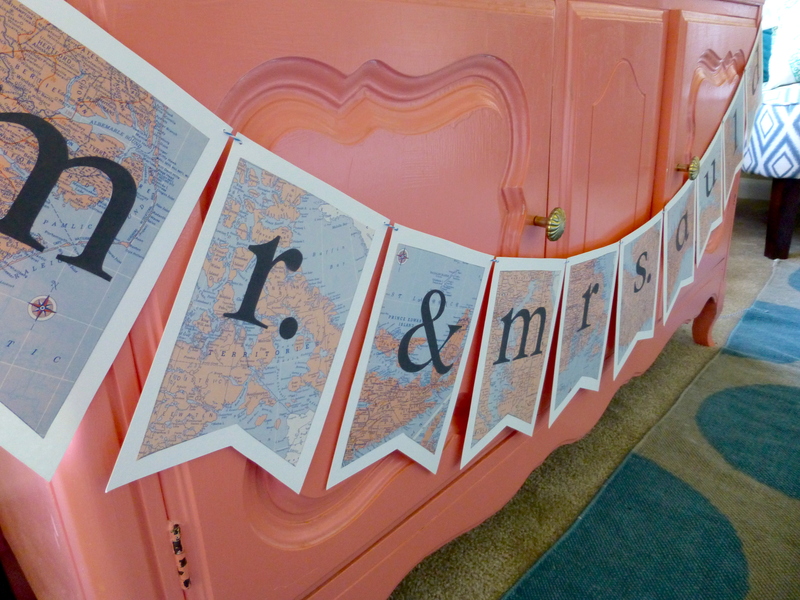 In making this bunting I really wanted to honor the couple and their history; I was able to actually include maps of Scotland (where they met), New Jersey (the bride’s home state), and Florida (the location of their wedding). Like the bride, I feel that things that are made by hand with love are special and worth the extra time, effort, and energy. This entry was posted in Uncategorized and tagged atlas, bunting, craft, DIY, etsy, handmade, maps, marriage, travel, wedding. Bookmark the permalink.